Guerrilla Theatre Works: A New Nation! Named DCMTA 2018 Outstanding Professional Production! 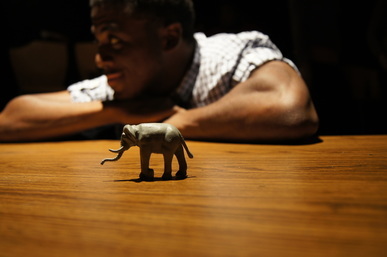 Guerrilla Theatre Works: A New Nation. Photography by Ethan Malamud. Directed and choreographed by Elena Velasco, co-directed by Natalia Gleason. Featuring Sebastian Leighton, Karoline Troger and Cristian Linares. Projections by Tewodross Melchishua Williams, Set design by Tom O'Reilly, Lighting by P. Precious Porter, Costumes and Props by Bria Gilbert, Sound design by Drew Weinstein, dramaturgy by Olivia Haller. Stage managed by Sophie Barden. And what may force you to leave? 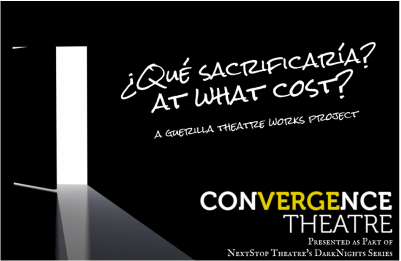 Building on the success of Guerrilla Theatre Works: At What Cost?, this third phase of Convergence Theatre's devised Guerrilla Theatre Works presses the troubling and changing concept of home, both here and abroad as we build A New Nation. REMOUNT COMING SOON! EMAIL INFO@CONVERGENCETHEATRE.ORG TO SCHEDULE YOUR DATE! noted by DC Theatre Scene as a work that "speaks truth to power." Witch. Photo Credit: Ryan Maxwell. Featuring (L-R) Janani Ramachandran, Sharalys Silva, and Stephanie Tomiko. Set Design: Josh Rosenblum; Costume Design: Kateri Kuhn and Ali Rocha; Lighting and Projection Sound: Philip da Costa. 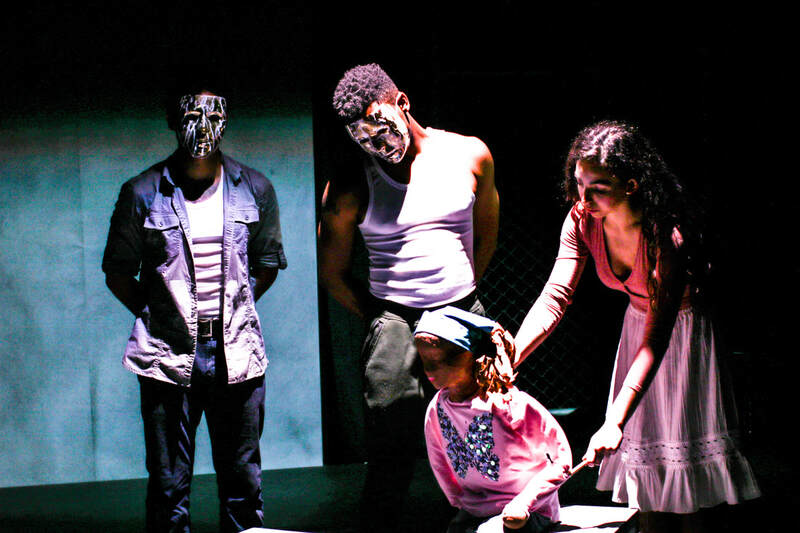 Convergence Theatre is a home for socially conscious artists who wish to spark dialogue between diverse communities through new theatrical structures. Convergence Theatre fosters a process-oriented arts collective, addressing widespread human struggles and unique cultural experiences by evolving theatre’s performance language through newly developed works. By engaging in an interdisciplinary approach to dramatic creation, Convergence Theatre produces multi-sensory performances that invite a wide audience base, encouraging discourse and dialogue over issues of social conscience. Convergence Theatre aspires to create a new generation of theater artists and patrons whose understanding of human expression is fully realized through multi-layered experiential communication, achieved through the fusion of the various elements of the dramatic arts. By accentuating the unique and the universal within symbol systems, Convergence Theater hopes to reach a multi-generational and multicultural audience base, thereby deepening and extending the examination of contemporary society and how to impact social change. more deeply examine our thoughts, practices, and interactions with others. · Through its multi-disciplined nature, theater is essential to cultivating understanding and compassion. · Focused work on non-traditional communication heightens our comprehension. · The synthesis of many arts disciplines allows us to expand the ability to create engaging imagery and artistic vision. · By embracing many forms of communication, all ages can develop a greater respect for one another. · Multi-generational and multicultural audiences encourage the involvement of all in the conversation of social change. · Through experiencing the stories of many cultures and generations in an artistic spectrum we foster a greater appreciation for the uniqueness of other people while identifying our common bonds. ​- Collaboration yields the most compelling performances. "The movement pieces of A New Nation impart the strongest impressions. The performers, especially Cristian Amilo Linares and Fabiolla da Silva, execute Elena Velasco’s choreography with strength and tenderness." - Kate Colwell, DC Theatre Scene (Photography by Ethan Malamud). FIVE STARS! 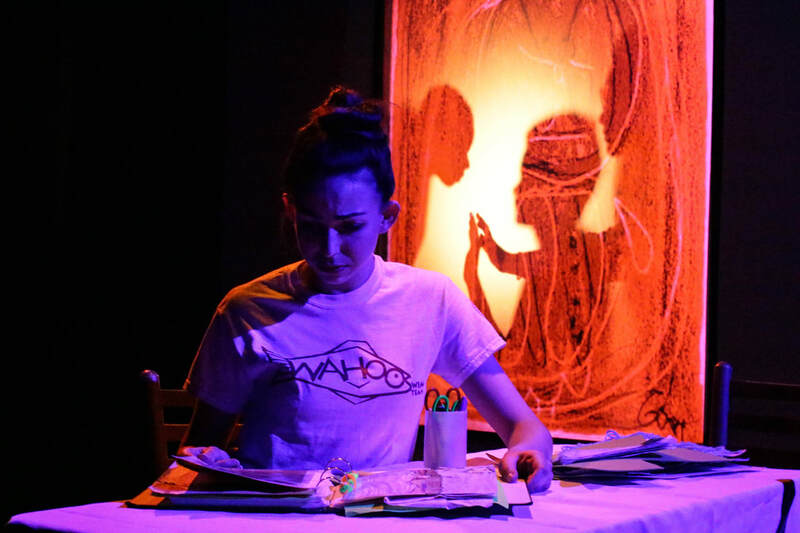 - "Director Elena Velasco guides her cast adeptly through the small space....Using projections, movement, and some classic storytelling techniques, this production puts a new spin on the theme that the people we love the most can also make us feel the most “stuck. "...This Is All Just Temporary deftly highlights the strength of the feelings of both love and guilt a family can elicit in us, and how we sometimes must come together to make impossible choices." - Jon Bavoso, DC Theatre Scene. This Is All Just Temporary by Olivia Haller, directed by Elena Velasco. Actors featured: Fabiolla da Silva, Raven Wilkes, Axandre Oge. Stage Management by Laura Schlachtmeyer; Lights and projections design by Philip da Costa; Set Design by Alex Miletich IV; Costumes by Madeline Belknap; Props by Carrie Kirby. Photo credit: Ethan Malamud. Theatre Washington 2017 John Aniello Award for Outstanding Emerging Theatre Company Nominee! Click below to have a look inside the Convergence Theatre process and mission! 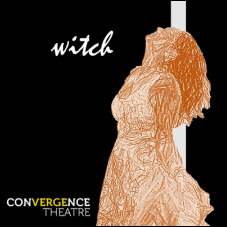 ​CRITICAL ACCLAIM FOR CONVERGENCE THEATRE'S WITCH! "If she is a witch, who then is not?" "....Mesmerizing to watch, and movingly performed." - DC Metro Theatre Arts. Bhavi the Avenger. Written by Tearrance Chisholm, directed by Elena Velasco. Featuring Marquis D. Gibson. 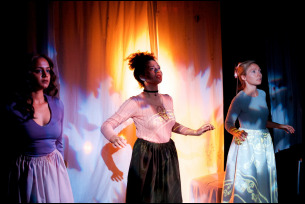 Lighting by Nate Collard, set by Josh Rosenblum, costumes by Madeline Belknap. Photo credit: Tori Boutin. Haunted by a slain elephant, Bhavi is set on a quest to avenge this gruesome death. Though named the chosen one, Bhavi's desire to only be one of many thrusts him into a world of cowboys in corporate suits. 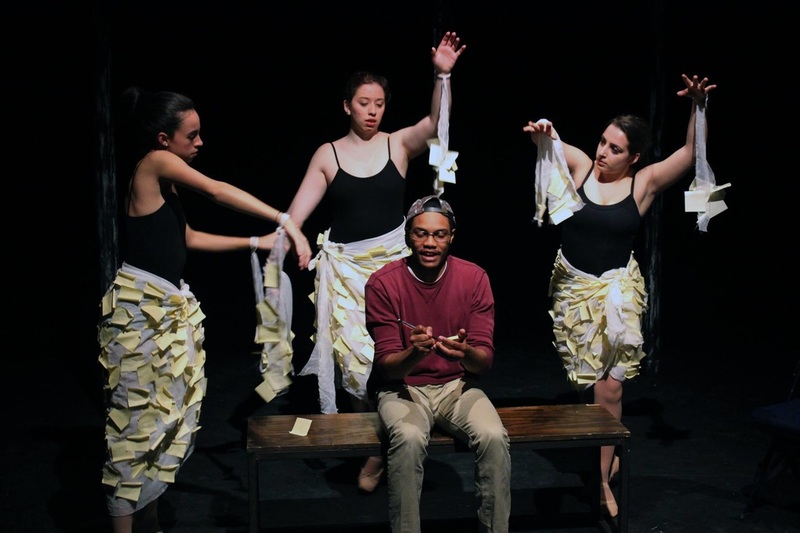 Written by Tearrance Chisholm, directed by Elena Velasco and developed by the Convergence Theatre collective, Bhavi the Avenger opens the conversation over the issues surrounding the "model minority" in the US, and how cultural identity shapes our world. At What Cost? /Qué Sacrificaría? A search for home in an unsafe world. Buscando una casa en un mundo inseguro. Una espectaculo homenaje a los que deben huir su hogar para encontrar un hogar. Esa obra estará presentar en inglés, español y una lengua de moviemento. 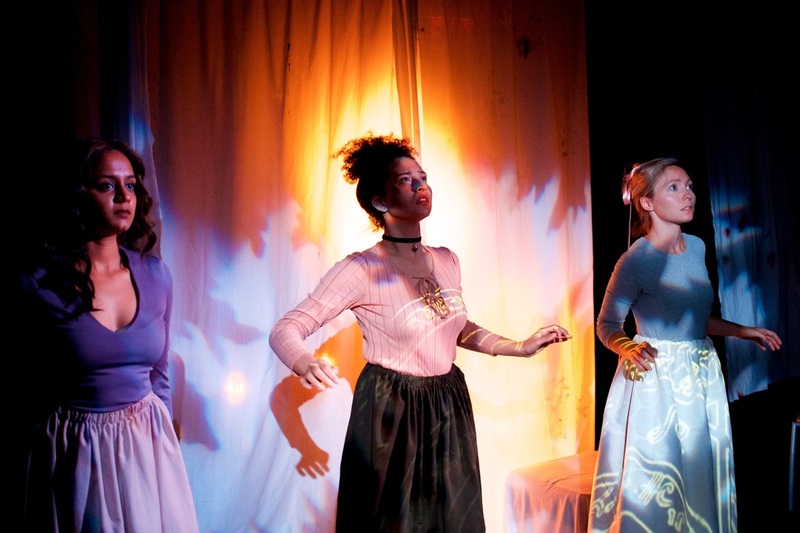 Convergence Theatre's production of Nurse Fawn. Directed and choreographed by Elena Velasco, written by Tearrance Chisholm. Featuring Inés Domniguez del Corral, Ali Rocha, Ellen Abhood, and Justin Smith.